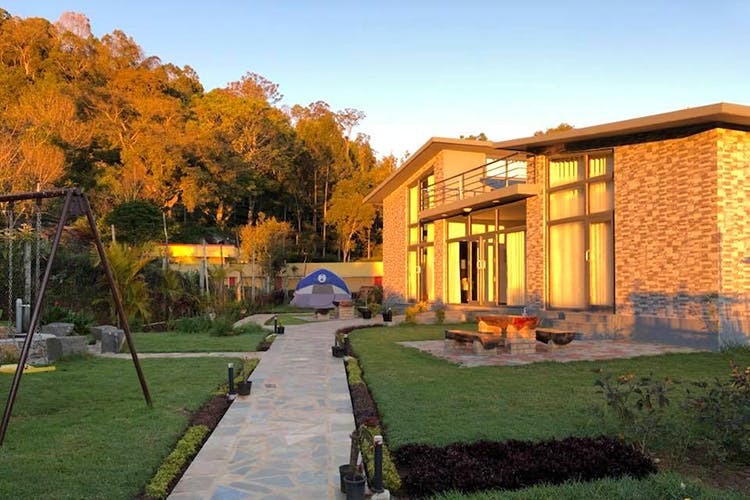 Located along the Mettupalayam-Kotagiri Highway, Silvertip Cafe & Homestay is perfect for families. The quaint homestay comes attached to a cafe and has tents and swings for the kids. With a cafe that acts as an entrance and greets you when you check into Silvertip Cafe & Homestay, you’re bound to get distracted by brownies, mini bites such as sandwiches and fries, and coffee. But hold your horses (and your kids), and instead, walk up the cobbled pathway and into the 8,000 square feet of open space just outside the swish bungalow. You can let the kids run around on the lawn or play on the swing set while you unpack in the spacious ensuite room with all the modern trappings such as WiFi and television. The kids will have a whale of a time with the swings sets, tents, and the neatly stacked bookshelf with children’s literature and board games. Your kids could spend the night at the tent if they want to have the whole camping out experience. We also wish we were kids to do exactly that. Large French windows and glass doors offer the view of the lawn as well as help you keep an eye on the little ones as they play out. You could probably sit outside on the benches or just lie down on the grass as you enjoy your well-deserved break. Come mornings, wake up to bird calls and hit up the garden for some yoga or stroll. Head to the cafe for your cuppa if you are feeling too lazy to make your own in the kitchen. Even if the homestay is off Kotagiri, the place does get cold in the evenings. On request, the fire pit can be lit and you can sit around warming yourself. Probably come prepared with a bunch of fireside stories to tell the kids. Better still, bring marshmallows to roast! Even though the homestay is on the highway, all the din from the road is muffled thanks to the trees. Catherine Waterfalls, Dolphin Nose Viewpoint, Bhavanishankar Dam and Banagudi forest are all nearby places that you can head to. The homestay can arrange for vehicles on request. You can book the homestay here.